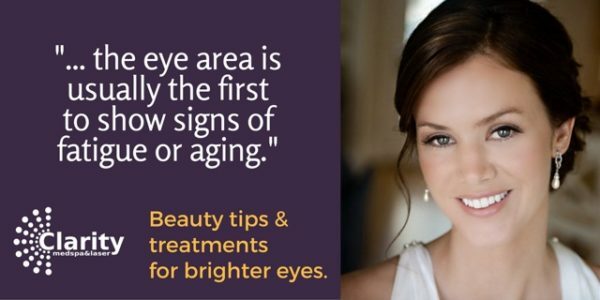 Whether male or female, the eye-area is usually the first to show signs of fatigue or aging. Typically, lifestyle and genetics are the main contributors and can present as dark circles, sunken eyes, bags, poor laxity or wrinkles. Compound these concerns with dehydration and the overall effect is usually one of looking chronically tired. Though we can’t stop the clock from ticking, there’s no need for panic: the experts at Clarity Medspa in Toronto have a number of restorative skincare regimens for your eyes. The easiest and most cost effective solutions to brighten your eyes come in the form of products that are specifically formulated to restore collagen and elastin while simultaneously addressing hydration. Here, we recommend epidermal growth factors, which have the ability to ignite fibroblasts & stimulate NEW collagen and elastin. Nobel Science based favourite is Bio Effect™ Eye Serum from Iceland, a plant based EGF (Epidermal Growth Factor) which ignites fibroblasts and cellular activity or NeoCutis™ Lumiere of Switzerland. Beyond topical products, you’d be surprised by the difference that simple brow maintenance can make for your face. Lexi Miles, founder of WaxOn™, tells us that “well defined brows and lashes can accentuate the full potential of one’s eyes. The key is to find experts who understand facial structure and have the finesse to shape accordingly.” A quick shape and tint in conjunction with the restoration of collagen and elastin will immediately brighten your entire face. Treatments such as Exilis™ Elite RF for skin tightening, Ultherapy™ for lifting and injections to soften lines or add volume are on the top of our list. Botox™ and Xeomin™ are client favourites for reducing wrinkles caused by squinting & frowning. Further, the dark shadows and hollows caused by a lack of volume in the area just under the eye can easily be treated with HA fillers. Hyaluronic Acid fillers will add volume to sunken eyes while simultaneously hydrating the skin in the area. Whether you opt for topical applications, brow treatments, cosmetic interventions or a combination of all three, you are assured of virtually no downtime and bright, beautiful, younger-looking eyes.